Once you have clicked on the “Register For This Class” button, our system will step through a few pages and will ask you to pay for the class online via our secure payment system. Your space in a class is not guaranteed until we have received your payment. If you prefer to pay another way, please call us at 865-980-0237. Making jewelry is fun, affordable, and so easy to learn. We'll prove it in this class just for newcomers. 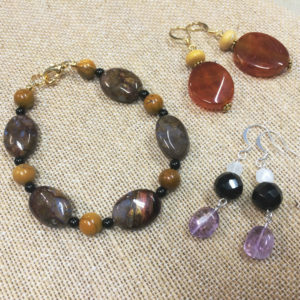 Learn how to string a bracelet and make earrings -- everything you need to know to start your new habit hobby. We'll also provide all the supplies. All you need to bring is yourself and some creativity (and maybe some glasses). This class is designed for absolute beginners. Come join us for a couple hours and pick up a great new craft! Staff instructor is Michelle. She's been teaching people how to bead for over ten years! What you get: Read your description carefully to see what’s included for a particular class. Class fee does not include supplies unless otherwise noted. How to get Guaranteed Seating in a class: Your fee must be paid in full in order to have a guaranteed seat in the class. Age limits: Classes are for age 13 and over unless otherwise noted. Please – no guests or children with you in the class. Minimum Attendance: Some classes are subject to cancellation due to low enrollment, so we appreciate when you register early. Cancellation policy: No refunds will be issued unless we cancel a workshop. If you are unable to attend a class, we ask for 2 days notice in order to issue a store credit, and your credit may be limited to another class with the same instructor. In the case of visiting instructors, class fee may be forfeited entirely. In the case of illness or inclement weather, we will do the best we can to make it possible for you to take another class. Copyright © 2019 . All Rights Reserved, White Fox Beads. | Privacy Statement | Site Design & Hosting by Jay Designs Inc.